Vacant Abode: Swatch-Were you cool enough to own one? Swatch-Were you cool enough to own one? In the 1980's everyone had a Swatch watch. Mine was white with a light blue dial and pink numbers, and I wore it in my fountain ponytail on special days! If you were really awesome you owned a cool Swatch phone (like the one below) and GUESS WHAT...??? This phone is actually two phones in one. That's right, both parts of the phone can be used as a handset, so two people can take part in the same conversation. Can you even believe it?? On a recent trip to Times Square my good friends and I visited the Swatch store. The two oldest ladies in the group (that would be me and the owner of the fabulous phone above), purchased ourselves two updated Swatch watches. They are pretty rad. We also saw the Naked Cowboy...don't be jealous. Yes, I had a Swatch Watch and so did Lindsay. 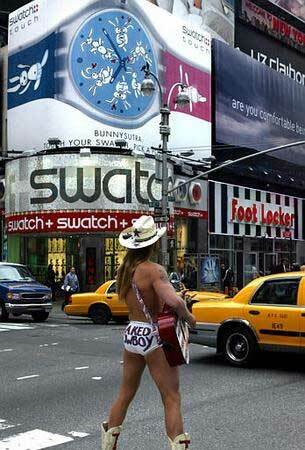 Yes, I am jeolous of Naked Cowboy!